Branden Voss (left wing) has committed to the Vikes for 2018-19 season. 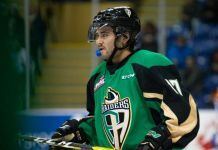 Voss, a native of Camrose Alberta, has played a total of 112 games in the AJHL over the past three seasons with the Drumheller Dragons, the Camrose Kodiaks and last season as the captain of the Drayton Valley Thunder. Branden Voss Joins UVic for up-coming year. University of Victoria with 156 games of Junior A experience playing in the BCHL, OJHL and SIJHL. The 6’1 defenceman is coming off one his best seasons as a Miner with 9 goals and 19 assists for 28 points in 36 games and was one of the nominees for the SIJHL’s CCM Hockey Best Defenceman for the 2017-18 season. season. “I chose the University of Victoria based on the quality of education, the quality of the people and the amazing location of the city of Victoria,” said Jennings. The 6’ 3 190 LB hard hitting two-way player, has played 99 games of junior hockey including 2 seasons in the AJHL with the Calgary Canucks and the Camrose Koidiaks, and last season a personal best of 11 goals and 12 assists for 23 points with the Kindersley Klippers of the SJHL. May, a native of Calgary Alberta, is grateful and thankful to all the people that have helped him along the way as he now focuses on the road ahead. parents for facilitating an unbelievable junior experience for me. I know for a fact that I would not be where I am today without these people in my life. left winger Hayden Guilderson has committed to the Vikes for the 2018-19 season. Guilderson who hails from Chilliwack BC where he played his minor hockey, has spent that last two seasons playing for the Estevan Bruins of the SJHL. The fast-paced hard-working playmaker who can put the puck in the net has put up 96 points in 116 games over the past 2 seasons for the Estevan Bruins. His hockey sense and IQ are a welcomed addition to the Vikes team. Hayden Yaremko of the University of Jamestown Jimmies. Joe Olson has committed to the Vikes !! Olson, a native of Maple Ridge BC, has spent the past 2 seasons playing for the University of Alberta-Augustana Vikings of the ACAC in Camrose Alberta. 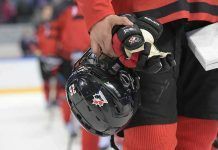 For the past 4 years the 6’2 defender has been playing away from home and was asked why he chose the University of Victoria?” When the opportunity came up to complete my degree at a top-end University in Victoria and playing hockey closer to home in front of family and friends, I knew it was the right decision and I am looking forward to getting started in September,” Olson replied. “I’m very excited to have the opportunity to contribute to the Vikes hockey team with our goal of winning a championship.” Finished Olson.